Item number 1472/2 from the MOA: University of British Columbia. Woman’s rectangular silk georgette wedding veil. A bright green central field, with over-all yellow dot pattern, has five circular red medallions, one in the center and one at each corner. These are embellished with yellow and white tie-dyed dots that form circular motifs. 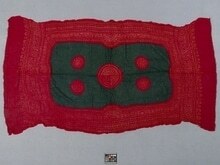 There are wide red borders on all sides, embellished with white, yellow and green patterns formed by tie-dyed dots. The surface of the textile is puckered. Part of the bride’s dowry, which she wears at her wedding and for special occasions thereafter. The veil is worn over the head, like a scarf, to cover the face and upper body, as the bride may only show her face to the immediate family. Worn with a kameez (long shirt with slit sides) and a shalwar (baggy pants). The colour red symbolizes blood and life. It is associated with weddings and is always included in dowry garments. There are references to tie-dyed cloth as symbolic of fidelity in Sindhi folk poetry. 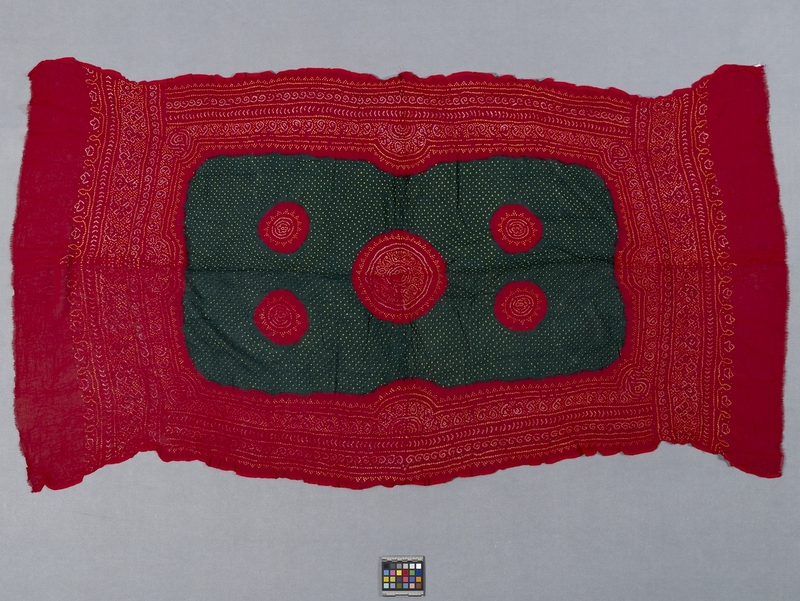 Ashiya Bai made this veil for her daughter-in-law as a wedding gift; it was part of her dowry. This veil was worn only twice. This piece was Ashiya Bai’s last work; she was getting too old to continue her craft. The daughter-in-law sold it to Razia Ahmed. Bandhani, which means “to tie,” is a style of patterning cloth by tying or knotting the patterned areas to protect them from the dye. Before dyeing, the textile is usually printed with the design using a wooden block and a temporary dye that washes out. This printed design serves as a guide for placing the ties. (Because Ashiya Bai, the dyer who made this veil, was very experienced, she formed the design freehand instead of first block-printing it.) The sheer silk georgette was folded into quarters and tie-dyed through all four thicknesses, using a cone-shaped metal ring on the fingertip or a sharpened fingernail to pick up very small sections of the textile for tying. A continuous string, which has been dipped in wax, is used to tie all the pattern elements on the piece. The piece is dipped into a dye bath, and/or dye is painted on with a reed brush. After dyeing and washing, the string is removed. Chemical dyes were used in the manufacture of this veil because it had become difficult to obtain the vegetable dyes that would have been used in the past. Napthol dye was used for the red and procian dye for the green. The dyes were fixed with turmeric and yoghurt.